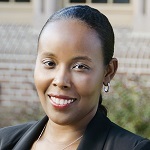 Robynn Cox is an assistant professor at the USC Dworak-Peck School of Social Work. Her research interests include the fields of economics of crime, health economics and labor economics, and are primarily focused on understanding the social and economic consequences of mass incarceration. She was a 2014-2015 RCMAR Scholar at the USC Schaeffer Center, where her research explored the impact of incarceration on health outcomes over the life course. Most recently, she received a Russell Sage Foundation Presidential Authority Award to investigate the relationship between perceptions of criminality, race, trust and employment outcomes. Cox’s research has also been funded by the University of Kentucky’s Center for Poverty Research through the Research Program on Childhood Hunger and the Young Investigator Development Grant. Her work has been published in various academic and policy outlets such as the Southern Economic Journal and the Economic Policy Institute, and she has presented her research at numerous professional conferences. Cox has been featured on both locally and nationally syndicated radio programs such as National Public Radio. In 2011 she was invited by Secretary of Labor Hilda Solis to take part in a roundtable conversation with Attorney General Eric Holder and the late Equal Employment Opportunity Commission Chair Jacqueline Berrien on workforce development and employment strategies of the formerly incarcerated. Prior to her appointment at the USC Dworak-Peck School of Social Work, Cox was an assistant professor at Spelman College and a postdoctoral associate in the Department of Economics at Duke University. She earned her MA and PhD in Economics from Georgia State University, where she was awarded the Andrew Young Fellowship. She completed her undergraduate studies at Duke University, where she obtained a dual AB in economics and Spanish and Latin American studies. Over the past forty years, the United States has taken part in an experiment in mass incarceration. This article explores the impact that mass incarceration might have on successful aging and racial disparities in aging outcomes. This study provided evidence that incarceration leads to roughly a 4 percentage point increase in the likelihood of food insecurity among households with children that have experienced a parental incarceration.